Heavy metal doesn’t often grace the front page of keithhirsch.com, but it has happened here and there. If you look around, you will see posts on early pressings of Iron Maiden Powerslave and Ozzy Osbourne Bark at the Moon. Here’s another one. In the 1980s, heavy metal got heavier and heavier — more guitars, more drums, and yes, more hair. This is evidenced that by the end of the decade, some heavy metal from the start of the period was reclassified as rock. A big part of the evolution of heavy metal during the ’80s that included the development of the grunge guitar sound was the American quartet Metallica. At the start, Metallica was James Hetfield on vocals and rhythm guitar, Kirk Hammett on lead guitar and backing vocals, Lars Ulrich on drums, and Cliff Burton on bass and backing vocals. As a result of the untimely death of Burton in a bus accident in 1986, Metallica has employed different bass players over the years. Here we will look at the third album from Metallica, performed by the original lineup of Hetfield, Hammett, Ulrich, and Burton. That would be 1986’s Master of Puppets. Speaking of evolution, Metallica started out raw with their debut in 1983, Kill ‘Em All. With each successive album through the ’80s, Metallica remained heavy, but refined their sound, and with Master of Puppets, Metallica was not just another thrash metal band. The 8-song album starts hard and heavy with “Battery”, but other offerings such as the title track, the instrumental “Orion”, and “Damage, Inc.” demonstrated Metallica’s unique ability to incorporate melody and soft passages to compliment their sound. 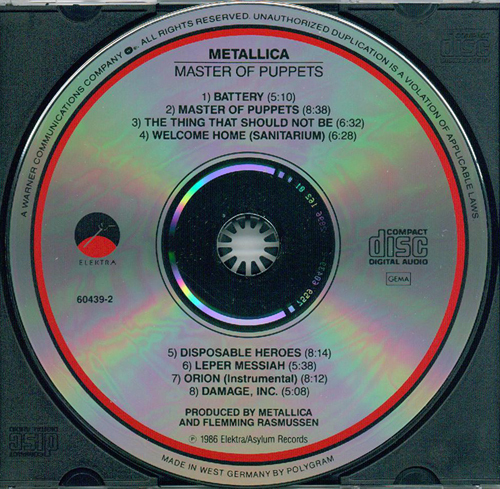 Looking at Master of Puppets on CD, Metallica was one of those artists back in the ’80s that was signed to different labels in different regions. 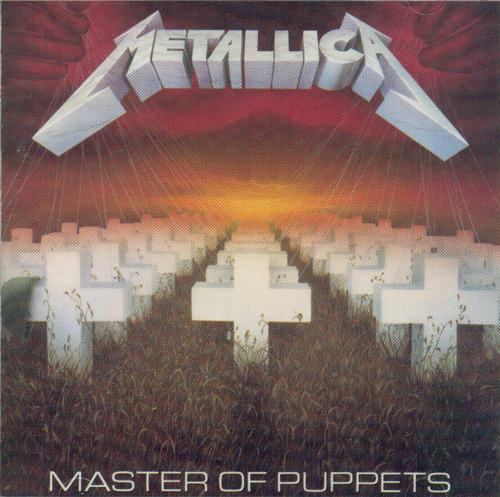 In Japan, Master of Puppets was released on CD in 1986 by CBS/Sony (catalog number 32DP 448). In Europe, the album was released on the Vertigo label, part of Phonogram (catalog number 838 141-2). In the U.S., Master of Puppets was released on CD in 1986 by Elektra Records, part of Warner Bros., under catalog number 9 60349-2. Here we will focus on this U.S. Elektra release. 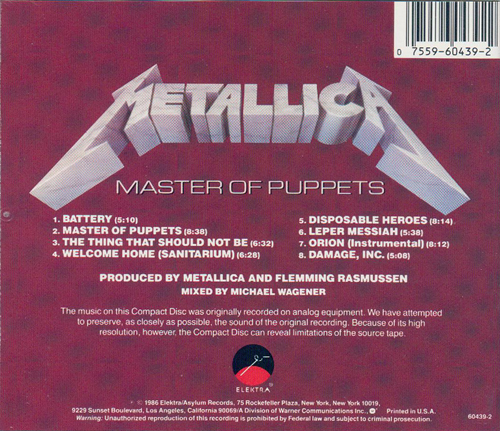 Of course, the Elektra release of Master of Puppets is typically found as a U.S. pressing of one kind or another. However, the original CD released in 1986 is a West German Polygram pressing. The inserts are the standard ones printed in the U.S., but the disc was pressed in West Germany. The disc bears the standard non-target label design for Elektra discs of the era — red and black rings around the perimeter, a red and black Elektra logo at 9 o’clock, black text, and no paint coating. As an early Polygram disc, there is no clear plastic ring at the center. The disc states “MADE IN WEST GERMANY BY POLYGRAM” along the perimeter, and the matrix code is “7559 60439-2 2896 162 01 #”. There is a slight variant of the above West German pressing, one pressed by PDO (Philips-DuPont Optical). The PDO pressing looks identical to the Polygram pressing except that it has “MADE IN W. GERMANY BY PDO” stamped on the play side of the disc adjacent to the center hole. The matrix code on the PDO pressing is the same as that for the Polygram disc. Shown below is the cover and back insert for the West German-for-U.S. pressing of Master of Puppets, as well as the Polygram pressing. Both the West German Polygram and PDO pressings are rare. The cover for the West German-for-U.S. pressing of Metallica Master of Puppets (Elektra, catalog number 9 60439-2). This is the standard cover artwork for this album. The back insert for the West German-for-U.S. pressing of Metallica Master of Puppets (Elektra, catalog number 9 60439-2). As noted along the bottom, this insert was printed in the U.S. The West German-for-U.S. pressing of Metallica Master of Puppets (Elektra, catalog number 9 60439-2). This disc was pressed by Polygram, as evidenced by “MADE IN WEST GERMANY BY POLYGRAM” printed along the perimeter. The matrix code is “7559 60439-2 2896 162 01 #”.